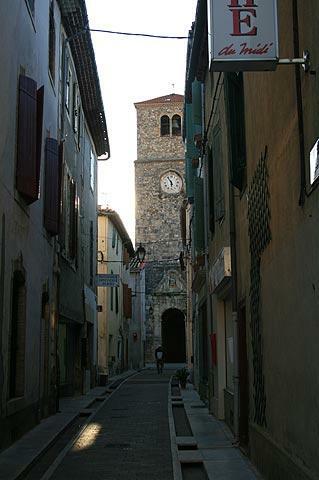 Quillan is situated in the south of the Aude department and south of Carcassonne, in the region often referred to in tourist literature as 'cathar country'. Set in the centre of a circle of mountains at an altitude of 300 metres, it is the scenery and Cathar history that will attract you to this part of the country, and Quillan itself is a pleasant town to explore and also quite a good size which makes it an excellent base for exploring Cathar country. 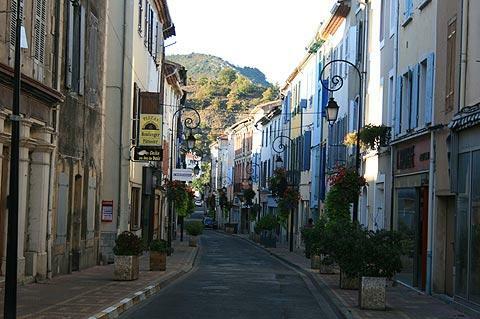 Quillan lies on the edge of the River Aude and has various squares in which you can sit and stop for a coffee or lunch. The highlight of Quillan is to cross the old bridge, an attractive stone arched bridge built here in the 12th century to replace an even older wooden bridge, and look at the long line of riverside dwellings. These are interesting tall narrow houses and you get a backdrop of the Pyrenees foothills behind and the fast-flowing river below. Very nice. The Place de la Republique is adjacent to the old bridge over the river. It is a pleasant spot to stop for a coffee and watch more adventurous souls head down the river in their canoes or kayaks. Around the Place de la Republique many of the straights streets still follow the layout that was used when the bastide of Quillan was established in the 13th century. On the other side of the river is the Chateau de Quillan. 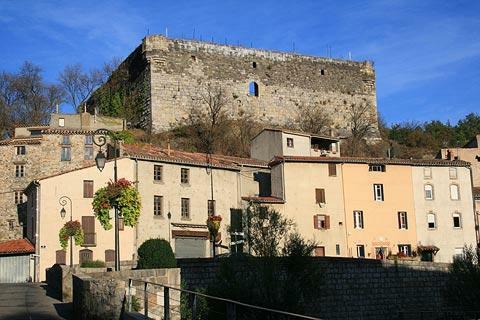 This was built to a very simple design in the 12th century then extensively fortified in the 14th century to defend against Aragon incursions - at that time Quillan was on the border between France and Spain. Much of the stone has been taken away and used for building the local houses but the base part of the castle remains and looks over the Place de la Republique. 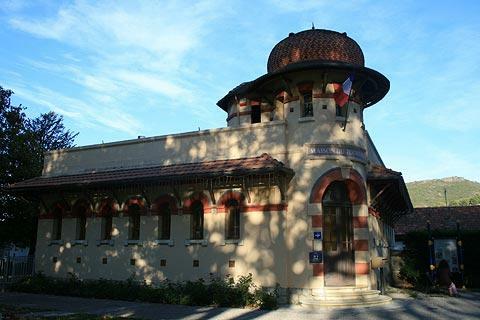 The strangest building in Quillan is the Tourist Information Office which used to be a bath house. It has quite a Moorish feel to it. 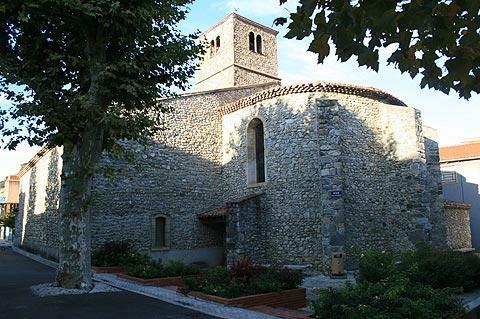 The church in Quillan is an attractive one with a tall square tower and a round section all built of stone from the river giving it almost a pebbled finish, and a pieta statue above the entrance. The church was built in the 14th century in the roman style, but because of a 17th century renovation and a 19th century enlargement to the church, there is not much to see of the original roman structure. 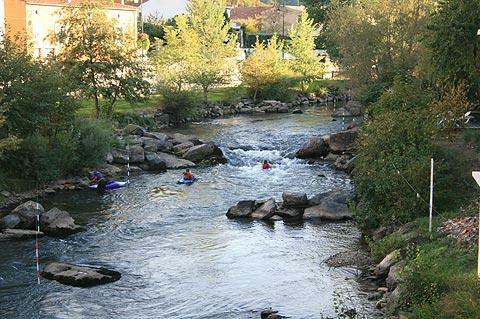 Quillan is a popular centre for anyone interested in water sports such as white-water rafting or kayaking. The town is also next to the very scenic Gorges de l'Aude. Other highlights within easy reach are the cathar castles at Peyrepertuse and Queribus to the east, and the village of Camon to the north-west of Quillan (Camon is officially one of the most beautiful village in France).